We are in a very dark place. I have never been much of a geologist, mountains are just big rocks to me, but even I have to admit the monolith is quite striking. It is described by the guidebooks as impressive but I find it oppressive too, quite unsettling. I’ve never been phased by a mountain before. It is black and blacker, the light disappearing into it, all absorbed - none reflected, like it steals photons. It looms, I can sort of feel it. When I turn my back it is still there, on the periphery of my vision and my mind. It is undeniable and inescapable. 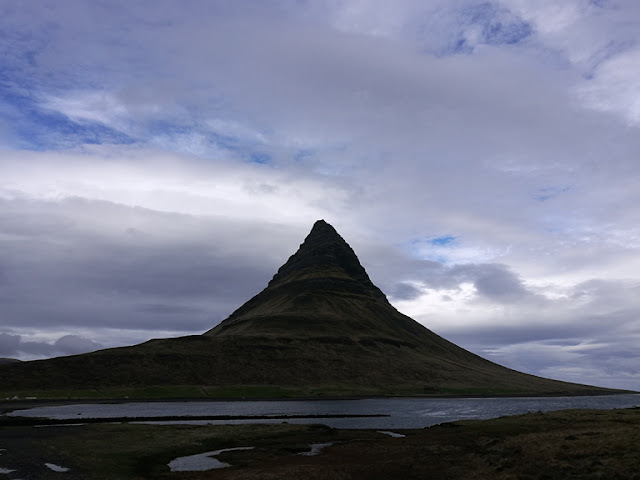 It is named Kirkjufell, it means church, but I’m calling it the Monolith. The Monolith rises steeply from the rough cold sea, on the northern shores of the Snaefellsnes peninsula in Iceland. 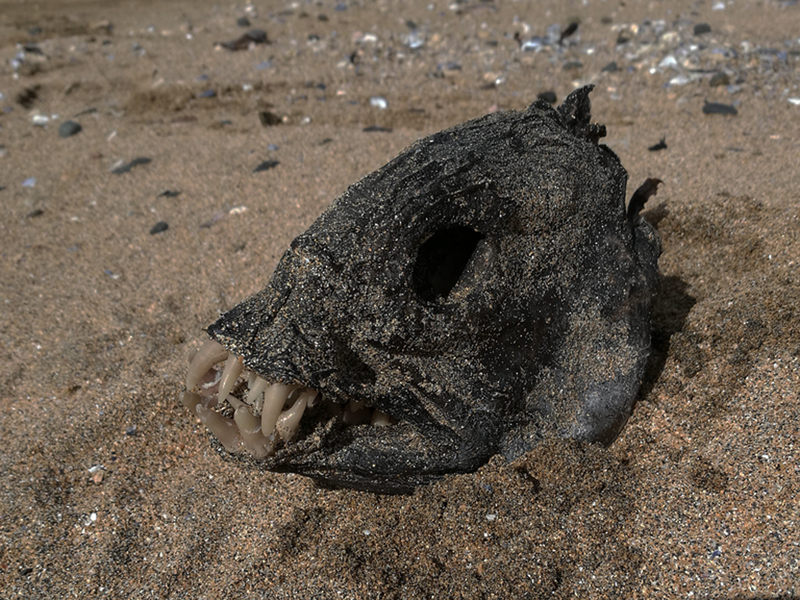 A river empties into a bay beside it, a seemingly dead bay, shallow and cold that in turn releases water to the sea. The water here and in the sea is black as the mountain. I look up from the dark water to the top of Kirkjufell/Monolith. The Monolith reaches a sharp point, it seems that the harshest weather cannot dull this pinnacle, even over thousands of years it has failed to blunt its razor sharp summit. The Monolith is HARD. I don’t feel like I am of this place, it isn’t somewhere I could survive. I want to go home. The weather must be a factor too. It is foul. The clouds are only just above the sharp point of the Monolith, the wind is coming from all kinds of directions and blowing over, under and around everything. 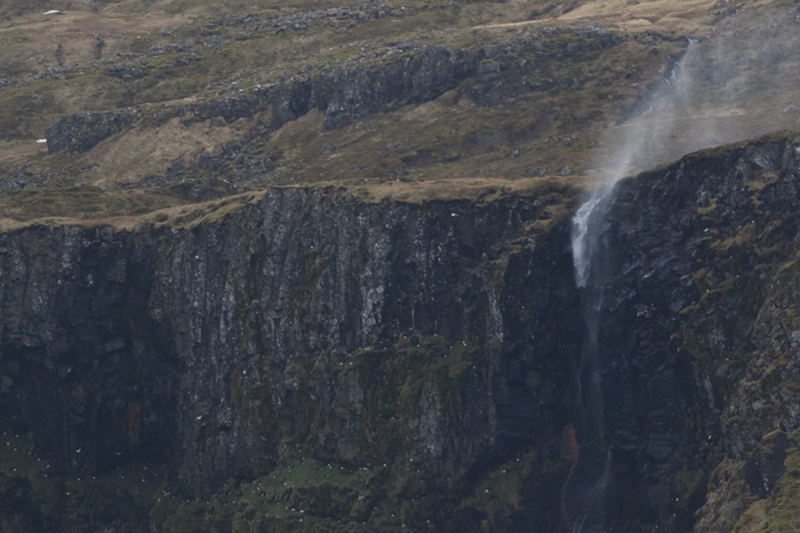 A waterfall is trying to live up to its name but can’t, the gale blowing it back up the mountain. Spring in west Iceland can be savage. The rock, the black, the wind, the cold. This place feels strong with the dark side of the Force. A bus load of tourists have stopped to photograph the Monolith and the waterfall that drops into the bay. The falls are a little disappointing today as much of the water usually to be found in them has not made it down the mountain. The party is a festival of brightly coloured gore-tex and DSLRs, the weather is testing the limits of both clothing and cameras and soon they are back on the coach, rumbling around the rest of the peninsula. Up the road is a place you can eat rotten shark if you wish, probably their next destination. We drove past. Instead I have some curious, slightly chewy savoury mini donuts sweating in my coat pocket. The coach rounds the headland and I am alone with the Monolith again. I walk along the road and cross a bridge where the bay empties into the sea via a short channel. It looks as if a troll could live under here and feels as if any moment a gang of Tolkienesque dwarves might swarm over the tourist bus as it trundles along the coast road. I pick my way along the rocky shore. In the silence and solitude my mind creeps to dark places inhabited by these creatures, I start to scare myself. I am looking for Knot (or any other wading bird) feeding on the seaweed that fringes the bay but I fear I may find goblins or orcs, maybe some other beast from Viking folklore. There is a painting by called Asgårdsreien by Peter Nicolai Arbo that hangs in the National Gallery of Norway in Oslo. It pictures the myth of the Wild Hunt, a horde of supernatural hunters thundering from a firey gash in a dark and foreboding sky. Hundreds of deranged looking warriors on deranged looking horses are in wild, bloodthirsty pursuit. In pursuit of what isn’t exactly clear but whatever is being chased has to be terrified beyond measure. In this place it seems like the Wild Hunt may descend from the top of Kirkjufell at any moment. Witnessing the Wild Hunt was thought to herald some disaster such as war, floods or at best the death of the one who witnessed it. This nugget of information doesn’t make me feel any better. Meeting any kind of mythical horde or creature here would not surprise me. Most of us, I would think, recognise a Harlequin as a comic character in plays, a duck or as a rugby team. All fairly innocuous, but it has several, often sinister origins. One is a story possibly related to the English figure of Herla King or Herla cyning, himself a leader of the aforementioned Wild Hunt, who as King of the Britons led his warriors in raids to the Otherworld and back. This legend possibly gives rise to an 11th century French folk tale (another version of the Wild Hunt myth), that recounts the story of a monk who was pursued by a mob of demons while roaming the coast of Normandy. The demons in question were led by a masked, club-wielding giant and collectively they were known as familia herlequin – Herlechin’s Troop. Herlechin, Herlequin, Herla King or Hellequin, eventually became Harlequin who was depicted as a black-masked emissary of the devil, roving the countryside with a group of demons chasing the damned souls of evil people to Hell. Neither of these tales is too reassuring if you are all alone beneath an imposing mountain by the side of a spooky bay during a storm in Iceland. My Harlequin is much friendlier. 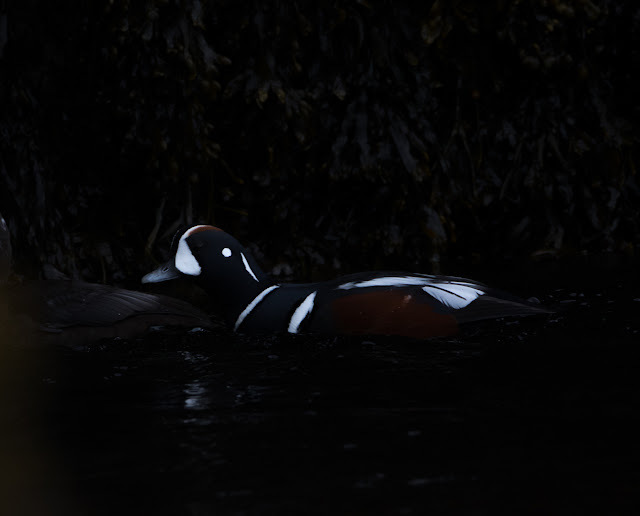 It is a fine drake swimming in from the choppy sea to the more sheltered bay. The plumage is beautiful and striking, there is nothing sinister about him. He swims easily against the chop, peering under the water and occasionally diving for prey, I cannot fathom what, the water is too dark for me to see. 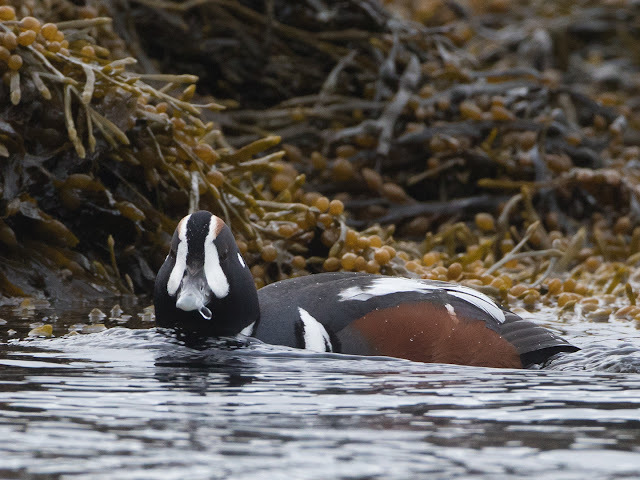 Apart from wandering irregular vagrants the Harlequin never turns up back home, for some birders it is almost as mythical a duck as Herla is a king. Seeing it here, in this strange creepy landscape seems appropriate. He fits in here as I don’t. 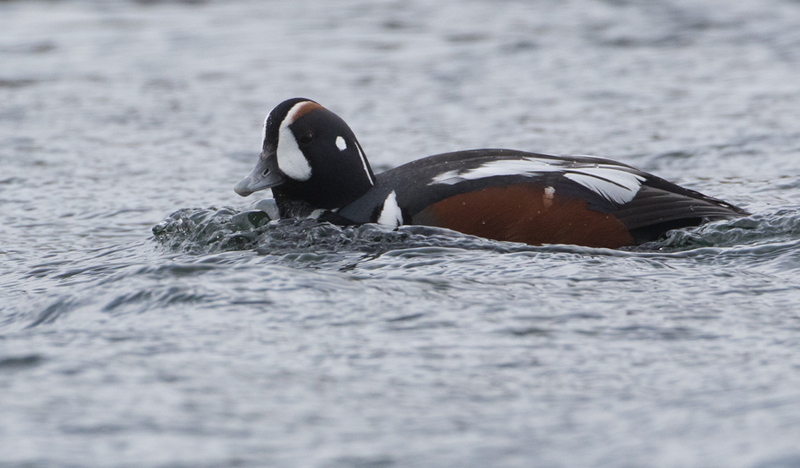 Harlequin swims close by, heading down the river towards the bay. He floats under the bridge, into the dark, just the white marks on his face visible – like a ghost and then he is gone. I wander up to the road and look out across the bay. He is nowhere to be seen. I stop, a little puzzled that I can’t find him on the small, calm body of water below me. I invent a portal into the Otherworld, a star gate to Asgard and imagine he has roared off there with Herlechin and Thor to chase Tolkein’s orcs on the wildest of wild hunts. I quickly banish those ludicrous thoughts. Perhaps it has lingered below the bridge. I fiddle with the camera settings to cope with the darkness I’ll find there then turn to have a look. I think again and decide not to follow him under the bridge. Who knows what lurks there.